You are here: Home » A more important D-Day? 44 years ago a momentous event befell the UK. That a change in the way we paid for things. The biggest change in 2,000 years. Gone were the Pounds, Shillings and Pence that kept the British economy running for all those centuries. Gone in a stroke of a pen. A different D-Day but just as momentous in shaping this country. Gone was the 20 shillings that made up the pound and the 12 pence that made up the shilling. We got 100 new pence to the pound. In the days, and months, before that momentous day in February 1971, the UK government at the time spent a lot of time informing, and educating, the people on what this would mean. It was quite a shock for the “old people” who had lived their lives with this strange system. Most of the complaints when the change happened was the usual. The shopkeepers will raise their prices by stealth. Rounding up to the nearest, new, pence. Not only the name was in doubt at the start of this process. Other names were thought of. Royals and cents or even the Dollar was thought about. Eventually, they settled on Pounds and pence. No more £sd [ LSD!]! The shilling was edged out and the number of pence was reduced. Even if the shilling was still in the British conciousness all the way until the 1990s when the new 5 and 10 pence pieces came in. When the shilling / 5 pence were interchangeable, you could have a while range of monarch faces in your change. Now we only have one. Queen Elizabeth II. 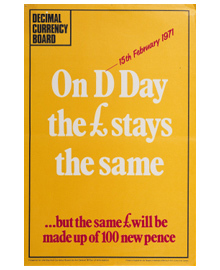 Leading up to day, the British government – well the Decimal currency board – helped with a variety of help to get you started on the new currency. From songs by popular singers of the day, such as Max Bygraves, to the public information film.